Hedgecutting competitions have been taking place in the Cottesmore country for over one hundred years. In what follows, George Morley of Teigh describes their history and aims. 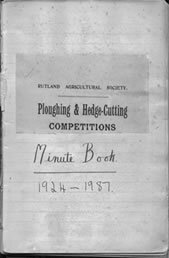 Hedgecutting competitions in Rutland began in 1898 under the auspices of the Rutland Agricultural Society. The first competition took place on Friday December 2nd in a field owned by Mr William Gore Marshall between Lower Hambleton and Edith Weston. There were ten competitors who were each required to cut and lay 11 yards (half a chain), and the judges were Mr JM Northen of Thorpe-by -Water and Mr George Freestone of Kilthorpe. The first prize was 3 sovereigns, second 2 sovereigns and third 1 sovereign! These one-day competitions continued to be run by the Agricultural Society along with ploughing matches until 1925 when a sub-committee of the Cottesmore Hunt took over the running of both the ploughing and hedgecutting competitions. The first hedgecutting competition organised by the Society was held at Braunston on February 10th 1926 on land farmed by Mr H Clarke and Mr H Freeman. In 1930 the competition was again held at Braunston when it attracted no less than ninety competitors! Also that year an 'on the farm' competition was held with a first prize of £20 and it was said that over 31 miles of hedge was laid in the Cottesmore country that year. The annual event was abandoned in 1939 until after the War. The Society then resumed with a ploughing match at Ashwell in 1946 with the next hedgecutting function taking place in March 1948 at the Stud Farm at Barleythorpe on Mr RW Wright's land. The one-day competitions continued until 1973 when it was decided that, as it became more difficult to find sufficient lengths of hedge on one site and the cutters found it harder to be away from farms at busy times of the year, the form of the competition should be changed. Thus the present style of event came about whereby competitors are able to cut and lay lengths of hedge (3 chains or 66 yards minimum) throughout the winter months provided that they are completed by mid-April. Two judges are then invited from other Hunt countries, and usually over thirty pieces of cutting are judged each year. There are two main classes: Class 1 (Open - for The Dickenson Perpetual Challange Cup) for professional cutters operating in the Cottesmore Hunt country and Class 2 (for the Robert Hoare Perpetual Challenge Tankard) for farmers and their family or employees cutting on their own land. There are also the Class 3 Special award for hedges which have been cut and layered having not more than three years re-growth since being a previously mechanically-trimmed hedge, the Class 4 Special award (for the Stephen Eve Challenge Cup) open to an ATB course trainee who has cut a three chain length of hedge to the judges' satisfaction and has not previously won the award, and the Class 5 ‘Best Regrowth’ award (for the John Partridge Challenge Cup) awarded to the cutter, in either class 1 or 2, with the highest number of points gained by their hedge cut in the previous year, for the quality of its re-growth. There are also another couple of special awards: a large bottle of whisky presented to each of those cutters who in the opinion of the judges have made a good effort on very difficult hedges, and the Cottesmore Hunt Tankard for the hedge-cutting trainee who attended a Rutland Training Group instruction course and who, in the opinion of the instructor, completed his task in the best manner. The Society is funded by generous donations by members and supporters of the Hunt. Prize-giving takes place at a presentation party in June or early July, and this was held at the home of the Society's former President the late Mrs NL (Gus) McRoberts for 28 years, and is now held at Mr and Mrs William Cross's Hilltop Farm, Braunston, with all the participating farmers and cutters being invited. The aim of hedgcutting societies such as ours is to see that the skill and expertise of the hedgecutter is carried on and passed down to the younger generation. To this end the Society periodically sponsors courses in conjunction with the Agricultural Training Board whose secretary is Mrs Jacqui Griffin on 01572770614. A very fine piece of hedgecutting. Rutland residents undertaking agriculture-related courses — which would include hedge laying — may be eligible for a grant from the Emma Molesworth Trust Fund which is administered by Rutland County Council. Grants may be awarded for course materials and equipment, travel to college or university, accommodation, course fees, special projects in relation to such a course, e.g. field trips or work placements. See RCC's website for more details.